If you haven’t managed to find yourself a Nintendo Switch yet, definitely keep your eye on this page on Amazon’s site. You can actually order one right now if you don’t mind paying a premium, or you can wait until Amazon restocks them at the $299.99 MSRP. If you do already have a Nintendo Switch, then you’re undoubtedly impressed with how fun it is to play. Beyond that, the hardware itself is impressive as well. It’s the perfect size, and all of the components feel nice and sturdy. Well, almost all of the components. The kickstand is a crucial piece of the Switch gaming experience, but it feels like it’s going to snap off every time you open it. It’s the only real complaint people have about the Switch’s design, but you can fix it very easily. Check out the Lamicall Nintendo Switch Stand, which is super affordable and made out of sturdy aluminum that you couldn’t break even if you wanted to. MULTI-ANGLE : Adjust the angle can reach 270°, easy to adjust, can be folded into a small piece, easy to carry. 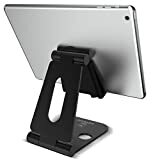 STURDY : Design with low center of gravity keep your large devices in safety, provide a more stable state when Playing Games, Facetime and YouTube. RUBBER PROTECT : The four rubber at the bottom to prevent sliding, and the rubber in direct contact with the phone to prevent scratching. COMPATIBLE : Compatible with devices in 4-10 inches, like Nintendo Switch, iPhone 6/6S/7 Plus, Galaxy S7 S6/Note 6 5, LG, Motorola, HTC, iPad Pro/ Air/Mini, Samsung Tab, Google Nexus, Kindle, even some devices added phone case. Play a good role in your office, kitchen and nightstand. LIFETIME GUARANTEE : If you are not satisfied with it. Please feel free to contact us, we will offer you a full REFUND or a brand new REPLACEMENT.